Quartet Glass Dry Erase Calendar blends versatile functionality with a modern upscale look. Elevate your office or home with this premium frosted glass dry erase calendar. This one-month calendar is ideal for personal daily use, and will help you organize your schedule with style. As this board is made with non-absorbent glass, you can write, erase and rewrite on a clean surface every time, without fear of stains or ghosting. This board is designed for long-term performance. The strong tempered glass surface resists scratches and dents, and is ideal for heavy use. Plus, the magnetic, steel-backed glass makes it easy to hang papers and documents instantly. Installation is simple with the included pass-through mounting hardware. As the screws insert through the front, you can hang the board accurately and evenly. Mount it vertically or horizontally to fit your space. Board comes with limited 15 year warranty, a removable accessory tray, one marker and two high power glass board magnets. 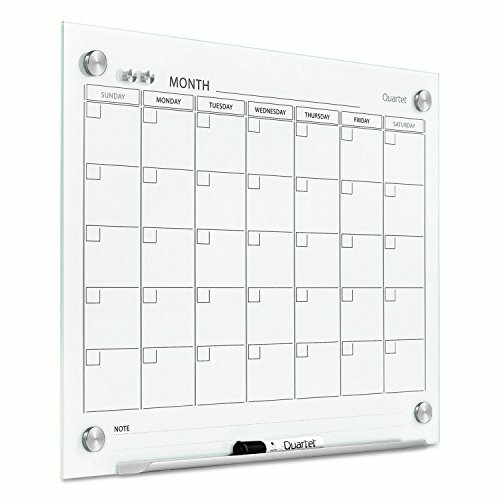 FRAMELESS GLASS CALENDAR - Elevate your space with a premium glass dry erase calendar. This one-month calendar is ideal for personal daily use, and will help you organize your schedule with style. CLEAN ERASE - Non-absorbent glass lets you write, erase and rewrite on a clean surface every time. Resists stains and ghosting, allowing your message to be communicated without distracting streaks. LONG-LASTING GLASS - The strong durable glass surface resists scratches and dents. Designed for long-term performance, this calendar is ideal for heavy use and comes with a limited 15 year warranty. MAGNETIC POSTING - Multifunctional steel-backed magnetic glass is great for meetings and presentations. Easily hang papers and documents instantly with the included high power glass board magnets. EASY INSTALLATION - Pass-through mounting makes installation simple. Screws insert through the front, so you can hang it accurately and evenly. Mount it vertically or horizontally to fit your space. ACCESSORIES INCLUDED - Measures 3' x 2' . Comes with removable accessory tray, 1 marker and 2 high power glass board magnets. For best results use Quartet Glass Board Accessories, sold separately.